Review originally published at FilmPulse.net. Director Peter Berg and star Mark Wahlberg continue their union committed to honoring proletarian American heroes in Patriots Day, a chronicle of the 2013 Boston Marathon bombing. While this film is shot with the same in-the-moment aesthetics as Lone Survivor and Deepwater Horizon, it’s a much more manipulative action-thriller than those previous worthy tributes. The detachment can be mostly attributed to Wahlberg’s fictionalized superstar cop and the breadth of the ground covered. In trying to give time to and some background for each major development, it feels more like box-ticking than meditation. Especially since we know the story so intimately already, attempts at depth-of-character come off as calculations designed to make us sad/angry/uplifted. Tommy Saunders (Wahlberg) is introduced as a prototypical movie cop. We learn in an awkward opening scene that he’s on suspension and part of his punishment is working crowd control at the marathon. He’s indignant that he’ll be stationed at the finish line. So, he, of course, is right in the thick of it when the bombs go off. Fine, but it almost becomes comical how involved this fictional character becomes in every subsequent event. He goes to the hospital to check on one of the victims being followed by the story, he’s first to contact the carjacking victim who escapes the bombers, he shows up at the shootout in Watertown, and he’s on the scene when Dzhokhar Tsarnaev (Alex Wolff) is finally found. 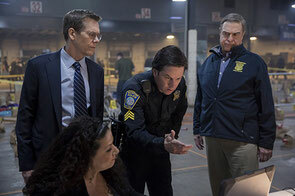 The most ridiculous scene with Saunders involves FBI Special Agent Richard DesLauriers (a real guy played here by Kevin Bacon) using him to recreate the movements of the Tsarnaev brothers in the moments before and after the bombing. There are literally hundreds of people working the case, but he’s the only one who can figure out which security cameras may have caught them. Saunders even gets a clichéd wife (Michele Monaghan) who gets to cry for him. She’s also put in danger at the marathon via contrivance. Though she escapes injury, it’s weird that she doesn’t stay to help any victims considering she’s a nurse. About the only thread Saunders isn’t involved in is the story of MIT police officer Sean Collier (Jake Picking), which may be the grossest example of exploitation. We know who he must be as soon as we see him in the halls of MIT, but Berg feels obligated to lather on the saccharine in the form of a planned date with a cute student that will never come to pass. It’s almost as if the director is daring us not to cry when Collier is callously murdered by the terrorists. This all speaks to the film’s lack of focus – perhaps something that could be attributed to three screenwriters plus two additional story credits. Everything and everyone is established early – all of the aforementioned players, plus J.K. Simmons as the Watertown Police Chief, victims Patrick Downes and Jessica Kensky (Christopher O'Shea and Rachel Brosnahan), Commissioner Ed Davis (John Goodman), Dzhokhar’s idiot college friends, Tamerlan Tsarnaev’s wife Katherine Russell (Melissa Benoist) – only to sideline them until they’re needed to plug into a tense moment, provide information, or to be beloved or scorned. Patriots Day is at its best when it sticks to recreating the procedural elements of the manhunt. There’s real conflict in the decision of whether or not to release the photos of the suspects, the logistics of working through thousands of leads is shown as daunting (until Saunders can swoop in and save you), shutting down the city feels significant, and the questioning of an enemy combatant deals with sticky civil liberties. Until, that is, the interrogator starts spouting applause-sign-flashing one-liners. Those are also common throughout. When we can see the action-consequence order of events, like what leads to the superbly shot and edited Watertown chaos, the film works as a provocative thriller, though the too-often disparate events fail to merge into anything profound. Saunders’ trauma and his familial troubles don’t cut it. As has become tradition with Berg’s blue-collar odes, the real-life figures of his film are showcased in a pre-closing-credit rallying cry. The victims and law enforcement officials are no doubt inspiring and their words resonate, but you can’t help but think you’d rather have watched a documentary on this subject than the ill-conceived two-hour-plus recreation that had come before. They deserved better.